Loom Knit Ten Stitch Blanket | NEW & Improved! 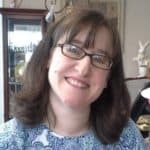 Hey, loom knitters, I’ve got big news for you today! Well, it’s bigger than big. Huge! Monumental! There’s a new loom knit Ten Stitch Blanket pattern in town and it’s better than ever. 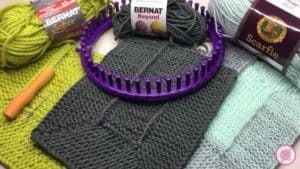 The ten stitch blanket changed the world of loom knitting because it can be done on any loom in any gauge with any yarn! All you need is a loom with 10 pegs and yarn. Frankie Brown took the knitting world by storm when she pblished her needle knit Ten Stitch Blanket 10 years ago. Since that time the pattern was converted to the loom, but sadly, it is no longer available. I decided now is the time to bring it back! 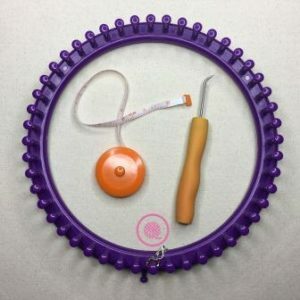 I got permission from Frankie to convert the pattern from needle to loom. 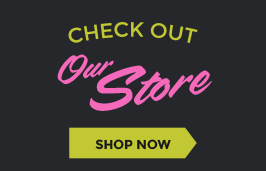 You may not know it, but Frankie has over 400 patterns available for free on Ravelry. Her patterns are free, but she welcomes donations to the Children’s Liver Disease Foundation, a cause near and dear to her heart. 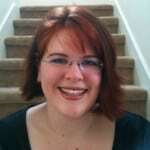 You can show her your appreciation by getting more details on Frankie’s Ravelry page. Rather than work from someone else’s conversion I decided to start over with original pattern. My assistant, Joann Gay, and I worked to make the directions easier to understand and smoother to knit on a loom. This is NOT the same ten stitch pattern you’ve used before. Seriously, you’re going to love it! THE CORNERS – We rewrote the instructions for the corners to make them easier to follow. Also, you have the option of working corners two ways: wrapping the peg or German short rows. See which one you like best! THE JOIN – You know that thick ridge as you join your edges? It’s now smoother and flatter. You also don’t have an extra (11th) peg to deal with. We think a loom knit ten stitch blanket should use 10 pegs! 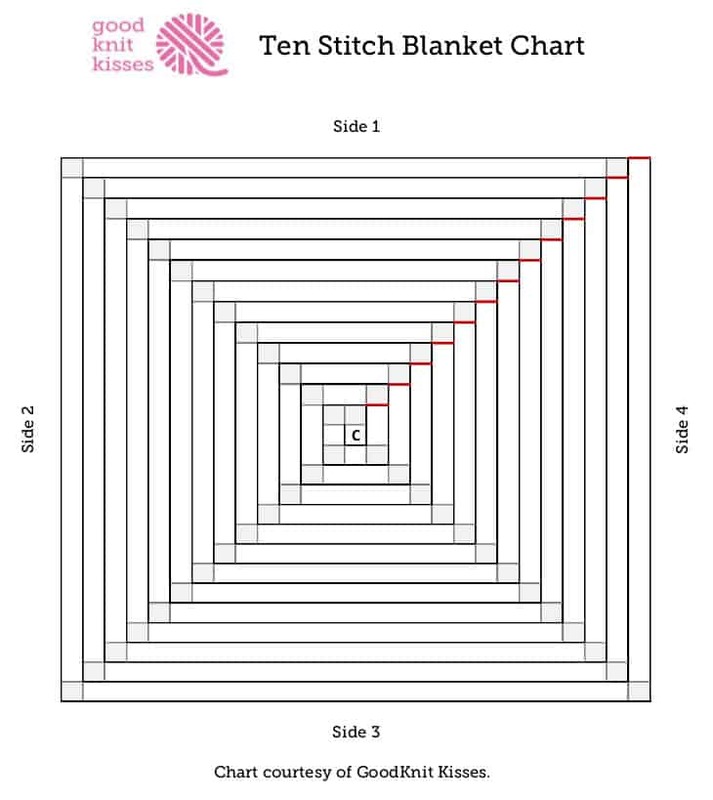 THE CALCULATOR – We’ve got a Ten Stitch Calculator to help you figure out how big your blanket will end up. It can also tell you how many rounds to knit to reach the size you want. THE PDF DOWNLOAD – The pattern is available as a downloadable PDF so you can load it onto your phone or tablet and have it available anywhere you go. THE VIDEOS – I’ve filmed a video showing the new techniques just for you. I know videos can be hard for left-handed loomers to follow so I have a special video just for you lefties to watch! Yarn: Any yarn that is an appropriate size for the loom you choose. Gauge: Not important for this pattern. S – Slip the stitch. Skip this peg and bring the working yarn behind. Join – Pick up one leg of stitch from edge to join and place on Peg 10. Wrap and knit over both loops on Peg 10. W– Wrap the peg. This is done in one of these methods (both shown on video). 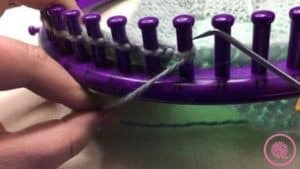 Wrap method – Wrap the working yarn around the peg from back to front and begin the next row working in the opposite direction. * You may knit more repeats of Rows 1 and 2 for a truly oblong blanket. Repeat Rows 3-38 one more time to turn the corner a second time. *** Do not repeat Rows 3-38 after this!! This is the only place in the pattern you will have two corners next to each other. Join 1 = Pick up one leg of stitch from edge to join and place on Peg 10. 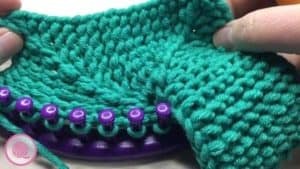 Wrap and knit over both loops on Peg 10. Row 39: S1, K8, Join 1. Row 40: S1, P8, K1. Repeat Rows 39-40 until you reach the end of the side. Repeat from ◆ to ◆ until blanket reaches desired size. Basic Bind off all sts. Weave in ends. Square Blanket: Each round you will knit 4 corners and 4 sides. The small red lines indicate where you finish each round. Rectangle Blanket: As with the Square, you will knit 4 corners and 4 sides on each round EXCEPT the last round. You will finish the last round after the 3rd side. Do NOT knit the last corner and side! Left-handers, this one is for you! I hope you love the new, easy Loom Knit Ten Stitch Blanket! Be sure and let know how you like it by tagging me with #goodknitkisses. I’m wanting to pick my blanket back up to hopefully finish it in time to use it this winter, but like Mary, I’m seeing puckering — but with every corner. I went over the German short rows many times and I really think I’m doing them right, so I’m not sure what I can do to fix this. Any suggestions? Did you block your blanket examples in the pics above? Am I going to have to start over? Hi Angela. The main reason this blanket puckers is if you pick up too many stitches along the side. It’s important to make sure you only pick up one stitch every other row. Whether you rip it out is up to you. Blocking may help reduce the puckering, but it won’t remove it altogether. I have this same problem. What do you mean every other row? Is there a section in the video that shows this? What would be the reason if a corner puckers?? My first corner puckered and none of the others. Hi! I’m loving this new ten stitch pattern. I have been loom knitting for a year and it’s great to have new challenges and patterns to try. I have a question about the pattern, straight rows and corners. After the initial 9 rows of garter at the beginning, is it just corners and joining for the rest of the blanket? If I’m reading the pattern correctly, that’s what it looks like to me. Do I need to knit straight rows at any point again? Thanks! Hi Kristen. 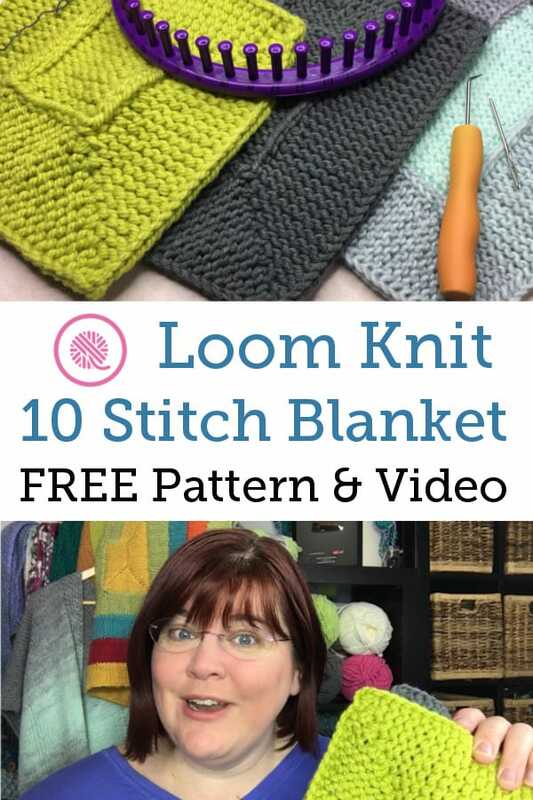 Thank you so much for this tutorial for the 10-stitch blanket. We are busy making things for prem babies and this will be an ideal gift to make on the loom. 10-stitch is my favorite of all patterns to knit for an afghan and when I found it for the loom I was excited to try it. Only problem I have is that I cast on left to right and in the video you cast on right to left. Took me a few to figure the directions out backwards but I have and am off and running now. THANK YOU #goodknitkisses for your wonderful tutorial . Hi Re! Kristen actually did videos for both left and right handers. If one video doesn’t show you the perspective you need the other one will. They are both linked on this page.